Hydraulique helm, 1 back up tiler. 5 batteries, 1 for the engine, 3 for the service, 1 for the WC, batteries rechargeable with the shore power, the solar panel and the engine. Steel hulled widebeam built in England by Handcock & Lane in 1980. 15 meters long and 3,20 meters beam with an air draft of less than 3 meters. The current owners own this boat for 25 years. The wheelhouse is at the rear with a hard top. A cockpit tent, redone recently, closes it at stern. Solar panel on wheelhouse roof. Engine room accessed from the wheelhouse by a large floor trap, the steps, leading to the interior, are movable. 2 gas bottles in the gas locker on starboard. 4 water tanks, 1 under the foredeck, the 3 others in the saloon lockers under the seats, all the 4 tanks are linked together for 660 liters of fresh water. 1 Diesel tank on port visible in the engine room, 600 liters, manuel gauge. The foredeck is equipped with wood seats, with possibility to install a small table. From this foredeck a ladder leads up to the roof and the solar panel on the wheelhouse hard top. 2 storage lockers on the roof. Dry docking done every 4 years for the last 25 years. Last antifoul in 2016 done by professionals. From the wheelhouse aft there are five steps down to the interior of the boat which is then all on one level except for the step up to the foredeck from the saloon. On starboard : cabin 1, a storage room (manuel WC), cabin 2, cabin 3, electric WC, saloon. The shower is wide and comfortable. The galley very well equipped with a cooker and oven and 2 fridges, one working on 12 V & 220V the other on gas and 220 V.
The cabin 1 with a bed for 2 adults 120 X 190 cm, electric wiring above the basin, storage spaces. The manuel WC, now used as a storage place, the toilet can be used again. The cabin 2 with 2 berths 70 X 180 cm, a basin & storage spaces. The saloon is wide and comfortable, able to accommodate owners and guests. U form seats on starboard, transformable into a bed of 130 X 220 cm. Opposite, is a seat and 2 large and deep cupboards. One step leads to the foredeck. Great quality of the floors. Central heating by diesel fored Eberpächer in the engine room, heats 4 radiators (water) circuit. Headroom, everywhere, from 1,80 to 1,85 meter. Boatshed Bourgogne is happy to offer this wide beam, "narrowboat", river star built by Hancock & Lane in 1980. A well travelled old lady this boat has been in the same careful hands for the last 25 years. 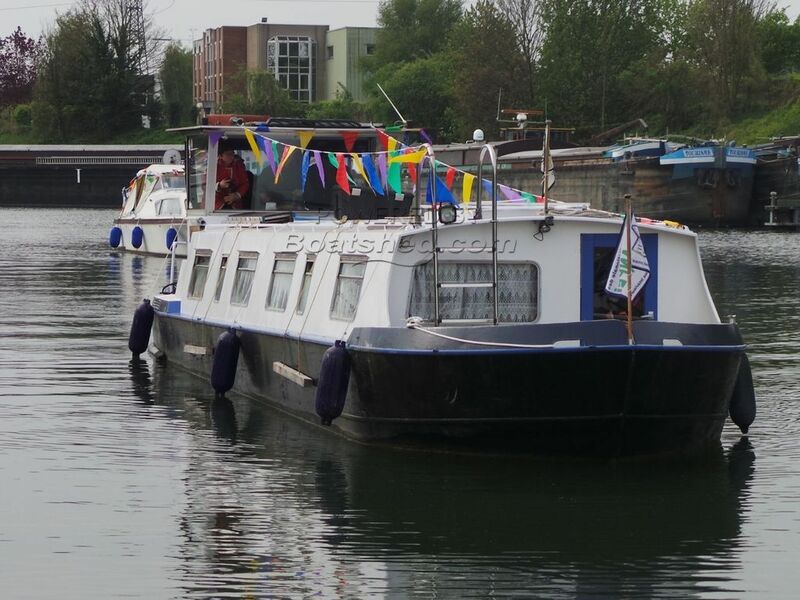 Very well equipped, this river star, wide beam, offers many berths and convenient accommodation allowing many people to enjoy cruising together. All on one level interior with quality headlinings, floors and equipment makes this a comfortable vessel that is really not showing her age. Also suitable as a liveaboard or pied-à-terre second home in France. For more information or organise a visit, please contact Cathy Bouguereau, your local broker at Boatshed Bourgogne. This Wide Beam Hancock Lane Liveaboard has been personally photographed and viewed by Cathy BOUGUEREAU of Boatshed Bourgogne. Click here for contact details.